Employees are the major assets of an organization. They are among the organization’s most important audiences with the potential to be its most effective ambassadors. It is essential that the employees perform together as a collective unit and contribute equally towards the realization of a common goal. Employees share a certain relationship with their colleagues at the workplace. The relationship which the employees can have can be between co-employees, supervisors, managers and higher management. It is important that the employees share a healthy relationship for delivering their best performances. Employees are the focal point of an organization during its journey towards success. If the employees work together and share a good relationship with management then the organization achieves its tasks and objectives much faster. Management of the employee relationship is both important and valuable for the organization in the achievement of the competitive advantage. It is necessary to have a strong relationship between employees as well as between employees and management since it leads to better organizational productivity and performance. Employee relationship management (ERM) is a term which refers to relationship development and management between the organizational management and the employees. There are a lot of different issues in ERM which can affect employee satisfaction and which has a direct result on employees’ productivity and overall corporate culture. ERM refers to managing the relation between the different employees of the organization. The relationship can be between employee and the management as well as between employees at the same level. It is nothing but a technique which brings employees and management together on a common platform and guides them so that the organization achieves the desired targets without fighting with each other. In a layman’s language, ERM is nothing but managing interaction of employees and management effectively so that tasks are accomplished without any hassles and confusions. ERM is a process which the organizational management uses to effectively manage all interactions with and between the employees, ultimately to achieve the goals of the organization. The human resource department generally plays an important role in this process, both in terms of training and coaching the employees as well as management personnel on how to effectively establish and nurture relationships. ERM is a management process which effectively monitors and manages the relation between individual employees either of the same team or from different teams. It activity helps in strengthening the bond among the employees and ensures that each one is contented and enjoys a healthy relation not only with each other but also with the management. Employees in the organization interact with each other during work, formally and officially as well as socially and informally. During the course of interaction, relationship develops, which is invisible connecting links, aided by emotions of love, hate, repulsion, respect, fear, anxiety and so on. These are usually mutual but not necessarily reciprocal. Relationship implies feelings for each other. It can be positive (friendly, wanting to be close) or negative (unfriendly, wanting to be distant). Relationship always exists between the employees who are interacting. There is no neutral point. Indifference is not neutral. Indifference tends to be negative. Relationship influences employee behaviours at work. Expectations of each other, perceptions of the intentions of either, distributions of assignments, readiness to conform or to rebel, enthusiasm to contribute etc., are to some extent outcomes of the relationship between the employees. Attitude and motivation influences, and is influenced by the nature of the relationship. ERM refers to the practices or initiatives for ensuring that the employees are happy and are productive. It offers assistance in a variety of ways including employee recognition, policy development and interpretation, and all types of problem solving and dispute resolution. ERM is a tool and a strategic process to manage and increase motivation of the employees by increasing the focus on continuous perfection of the individual relationships between the management and the employees. ERM is a critical success factor for strategic human resource policy of the organization. ERM is not technology, or software product, but a concept. ERM is viewed as an advantageous approach since it offers mutual values both for the employees and the management. It provides the employees the greatest possible satisfaction of their individual needs, while the increased attraction, retention, motivation and performance of employees are values which become available to the management. Employee relation refers to the total relationship between the management and the employees in regard to the establishment of conditions of employment. In the past, the term ‘industrial relations’ has been used to describe this relationship. However, this has largely been replaced by the broader term ‘employee relations’. Although the two areas are similar, industrial relations usually refers to the resolution of conflict between the management and employees, while employee relations is an approach which incorporates all the issues in the management–employee relationship in the workplace which also includes recruitment, equal opportunity, training and development, and organizational structure. It involves maintaining a work environment which satisfies the needs of individual employees and management, improving employee morale, and building organizational culture. From the employee relations perspective, an employee is an asset rather than a cost, and open communication and goal orientation are encouraged. It is accepted that legitimate differences exist in workplaces, but the aim is to reduce conflict through effective procedures and relationships. An effective employee relation involves creating and cultivating a motivated and productive workforce. Employees are motivated from within, since the management help to nurture the type of environment where employees thrive, enabling the organization to outperform the competition. Organization with effective ERM is continually examining ways to improve competitiveness and profitability. Central to these objectives is the effectiveness and efficiency of its employees. The organization seeking to improve performance uses its employee relations processes to (i) encourage an effective team of employees as a way of adding value to all areas of its organizational performance, and (ii) focus on using specific strategies to retain, reward and motivate effective and skilled employees. There are four critical components for achieving effective ERM in the organization. These are (i) the employee relations strategy, (ii) management capability, (iii) the employee voice, and (iv) internal communication. A successful employee relations strategy starts with the organization’s leadership, but lives and breathes throughout the fabric of the organization. Through this strategy, it is vital that the management defines the employee relations climate it wishes to create and maintain in the organization. Management capability also has to be a priority which ensures that employees are motivated on a day-to-day basis by their immediate line manager. Front line managers need to be equipped to manage employees effectively, fairly and consistently in line with the organization’s expectations and needs. To support this, having an effective and credible way of listening to employees and acting on what they say is another vital component towards creating a healthy employee relationship climate. Maintaining a two-way dialogue is equally important, and creating the right type and range of employee voice is as relevant. Also, meaningful internal communication is a key to bringing the employee relations strategy to life. It is quite often that the management either over communicates, or fails to communicate enough. Also, channels of communication are often outdated and the right language for the audience is rarely used. The core issues which need to be looked into by the management for ERM (Fig 1) are as follows. Communication – Open communication between the employees as well as between the management and the employees is very vital. Transparency in communication is also very important for a healthy employee relationship management. When employees feel that they are not being heard, they become frustrated which lead to their lower morale. Lower employees’ morale can result in lower productivity and an uncomfortable, or even hostile, work environment. Conflict management – When any problem arises, it is necessary for the management to go into the root of the problem. Finding the basic reasons of the problem and removing them, is important for the handling of the problem. Removal of the conflicts between employees and the management is a fundamental aspect of the ERM. Group activities – Group activities at the workplace are to be encouraged. Individual employees are to be motivated to work together probably in a group so that the comfort level increases. The more the employees interact, the more they get to know each other and more they come closer to each other. They develop behaviour where level of cooperation and trust is high. It helps in meeting of the targets and the deadlines. Employees’ growth – If the work environment becomes monotonous to the employees and if a feeling crops up in the employees that they are only required for putting in their hours at the work, then they work mechanically and their motivational level drops drastically. If employees of the organization have the feeling that they are a valuable asset for the organization based on their work, as well as their abilities provide the organization important ideas and offer input for the improvements in the organizational performance, and they have enough opportunities for their growth within the organization then a positive work environment gets created within the organization. Management is to support this aspect of the ERM so that the organization performs well in the competitive environment. Focusing on ERM can have profound effects on the operating results of the organization. Conducting employee surveys is a useful tool towards reaching a beneficial level of ERM since they provide an opportunity for candid feedback and analysis which is not achievable in typical feed-back communication. 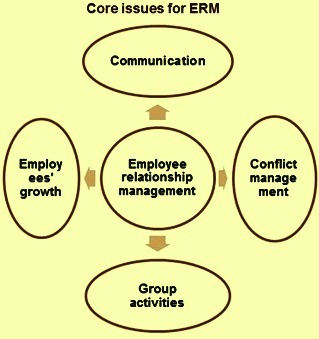 Components which influence ERM in an organization are given below. Human resource (HR) practices – HR practices in the organization has a big influence on the ERM in the organization. Improved quality and productivity linked to motivation can be achieved through training, job rotation, job satisfaction, participative management, performance appraisal, and career planning and development. Appropriate policies on these issues improve satisfaction of the employees in the organization hence improve the ERM status in the organization. Better ERM status in the organization makes employees more satisfied and improves employee’s performance in the organization. Trust – Trust is a critical variable influencing the performance, effectiveness, and efficiency in the organization. It is considered one of the most influential variables on organizational performance. Trust can grow, decline, or even re-emerge over the course of a relationship. As the length of a relationship increases, employees have more opportunities to observe and learn about each other. Trust normally consists of two elements namely (i) integrity, and (ii) reliability. In ERM trust has a major role to play since it determines the level of reliance one can place upon his colleague and confidence in the relationship with him. In fact, trust is a key relationship element. Communication – Communication is very important for the organization since it has a big influence on the ERM. It serves as the coordination link between the employees and the organizational functions. Ongoing, frequent two way communication is one of the most important components of a comprehensive ERM strategy. Interactive communication, both giving a message and actively listening to what is being said in response builds trust between employees or between employees and the management. Communication in the organization refers to the extent to which the organization informs employees about important issues in the organization. Such important issues include organizational policies, values, mission, strategies, competitive performance, events, cost data, and changes which affect the organization and the employees. Organizational communication can be done either formally through formal structures or informally by means of unstructured procedures. However, informal communication is more credible than the formal one as it allows team flexibility, open discussion, better flow of ideas and greater efficiency and productivity. Communication with employees strengthens their identification with the organization and creates organizational solidarity due to trust among employees or between different departments. Leadership style of the management – Leadership style of the management is considered a factor which has a major influence on the ERM and hence on the performance of the organization. Leadership style, often called ‘management style’, describes the approach managers use to deal with employees in their teams. There are many styles of leadership. These include (i) charismatic/non-charismatic, (ii) autocratic/democratic, (iii) enabler/controller, and (iv) transactional/transformational. Shared goals and values – Shared values is defined as the extent to which management and the employees have beliefs in common about what behaviours, goals, and policies are important or unimportant, appropriate or inappropriate, and right or wrong. The essence of a shared goal is that it is a reflection of connection among employees and management towards an important undertaking. The coherence help employees understand how work is related across all the departments, levels and units in the organization as well as aligning the work of employees with the organization’s strategic direction and priorities. Sharing common goals enables employees to direct their efforts to the achievement of that particular goal, but for that to happen there need to be interdependence and collaboration among employees. Sharing common goals can positively impact on employee performance and organizational outcomes. The important functions of ERM are given below. Create a healthy and balanced relationship within the organization between the employees and between management and the employees. Create a work culture within the organization which is live, challenging and dynamic. Boost the confidence and morale level of the employees and to encourage the employees to give their cent percent at the work place. Bring out the inner potentials, creativity of the employees to the forefront so that the employees feel free to come out with new innovative ideas and opinions for the organizational improvement. Create an organizational environment where all the employees are treated fairly without any discrimination and favoritism. Develop and improve the level of coordination between employee-employee and between employee-management for better communication so as to avoid conflicts in the organization. Encourage employees participation in decision making and create and atmosphere in the organization where the employees can actively take part in the seminars, learning and cultural programs. Create an atmosphere where the employees feel more responsible and focused towards their task and which make them feel that they and their contribution both are important for the organizational performance. Work on a continuous basis for making the employees more productive, efficient, skilled and proficient in their work. Help employees to be more flexible so that they are ready to take additional responsibilities as and when need arises. Maintain a work culture where employees find the work place stress free, clean and safe. The performance of employees improves drastically, if they are at home with the equipment, tools and workplace. Protect the employees from occupational hazards and take care of their health. Employees feel highly motivated when they find that the organization cares for their health. Healthy employees at the workplace improve the performance of the organization. ERM helps the management in improving vastly the following employees’ related issues. Absence of ERM in the organization hinders work productivity and quality. Interpersonal relationship within the organization. Employees’ concentration at the workplace. Employees’ taking frequent or long breaks during work hours. Employees’ punctuality while coming for work. High attrition rate of the employees. Hostile environment at the work place. Disinterest of the employees in the job and dissatisfaction with the work, work place and the organization itself. Issues related to the employees’ growth and advancement. Issues related to the employees’ compensation packages. Issues related to discrimination and favoritism. Issues related to the balancing of the work and the life needs of the employees.